Quark gets recruited by a dangerous dame for a box job that almost leaves him a stiff. 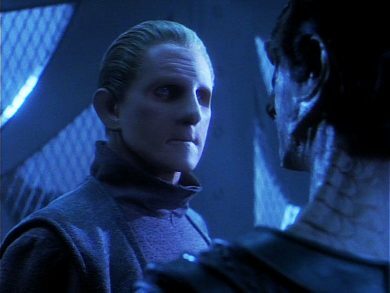 Can a gumshoe like Odo solve that and a years old murder mystery? They both point to a con that moved a lot of lettuce to a lot of sharpers. Let Rom pour you some hooch – it’s going to be a bumpy ride… Mission Log takes on Necessary Evil.